The buzz around my Toronto office space on Thursday was how Neil Pasricha concluded his blog that was a list of 1000 things “AWESOME”. It all began on June 20, 2008, when Neil set out on a mission to write 1,000 blog posts. Each of his weekday blogs was to chronicle of one awesome thing and count down until he hit #1. After launching “1,000 Awesome Things”, he started to get some attention from his friends and colleagues, but it really gained traction 20 posts in, when post 980 was linked to on a site called Fark.com. His blog’s popularity began to snowball further after Wired Magazine wrote about his blog and called post 980, which was titled “Old, dangerous playground equipment”. Pasricha probably had no idea when he started his blog that it would lead to three books (two of which became international best sellers) and an app for smart phones. He even won a Webby award in 2009 for Best Personal or Cultural Blog. In hindsight it is hard to imagine that a blog about AWESOME would get over 30 million hits just for the topic of AWESOME. I am sure many other bloggers are saying that they could have done that – they could have cashed in on the keyword AWESOME and wrote three books. The fact is they did not do it, Neil Pasricha did, while still keeping his Toronto office job at Walmart. 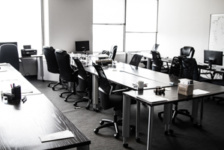 In blog “#255 That guy who brings treats to work on Friday”, he talks about the 5 ways everyone in his Toronto office space finds out there are treats in the office. Unlike his office space, the treats in my downtown Toronto office space are not placed by a co-worker, but left out and announced by someone working for another company. When someone brings in treats they wish to share with other people who rent office space Toronto at Telsec Business Centres, they leave them in one of the two shared kitchens (where we all get our complimentary coffee, tea and filtered water) with a note telling people to share. 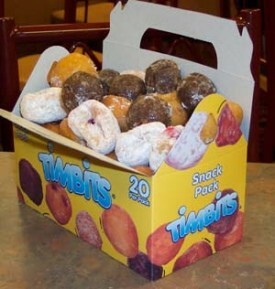 At my office space Toronto, there is one person who will randomly leave a fresh box of Timbits in each of the kitchens, but no one seems to know who it is and why. I have talked to the staff at the Tim Hortons on the fourth floor of the building to see who the mystery person is, but they are hush. They do not want to lose a customer. Yes, even with the AWESOME complimentary coffee and tea available in the office, some people are still drawn to get their Tim Hortons fix at the CafeOn4. I will admit that I often slip down to CafeOnF4 for lunch and sometimes I will go down there for an IceCap, when I am not in the mood for just my free Hazelnut coffee (Yes, I love my complimentary hazelnut coffee in my Toronto office space). My last comment is more of a question… How many things could people say was about their AWESOME Toronto office space? I think I could list 20 or 30 and that is not including having the AWESOME address of 1 Yonge Street.